Synopses: Part one - Sarah Jane Smith, investigative journalist and former companion to The Doctor, is back in a brand-new CBBC drama from the makers of Doctor Who. And in the first two-part story of the series she faces some familiar alien enemies of The Doctor as the Slitheen are back and out for revenge... On their first day at their new school Maria and Luke soon realise that all is not as it seems. There's a funny smell, the food keeps going off, the teachers keep farting and the new technology block is hiding some dark secrets. With their suspicions aroused, Sarah Jane, Maria and Luke set about investigating, joined by their new friend Clyde. They soon discover that the Slitheen have disguised themselves as teachers as part of a deadly plan which threatens the future of the Earth. 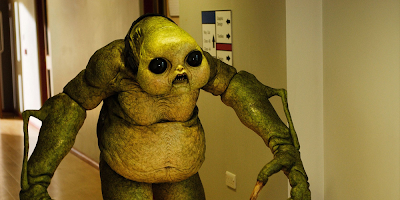 But as Maria, Luke and Clyde become trapped in the new technology block in the clutches of the Slitheen and with Sarah Jane under attack from another of the alien monsters, will the gang be able to stop the Slitheen before it's too late? Part Two - Trapped in school with the monstrous child of the Slitheen, Maria, Luke and Clyde make a timely escape thanks to some deodorant and the help of Sarah Jane and her sonic lipstick, as the drama continues. With the Slitheen's deadly plans to destroy the Earth well under way, the gang race back to Sarah Jane's attic to work out how to stop them. Helped by Mr Smith, Sarah Jane's super-computer, they soon discover that the Slitheen are going to drain all the energy from Earth using a worldwide network of giant supercapacitors. But as a power black-out starts to spread across the world, taking Mr Smith out of action, time is running out and the gang have to rely on their wits alone. Will they be able to save the Earth before the Slitheen switch off the Sun for ever?